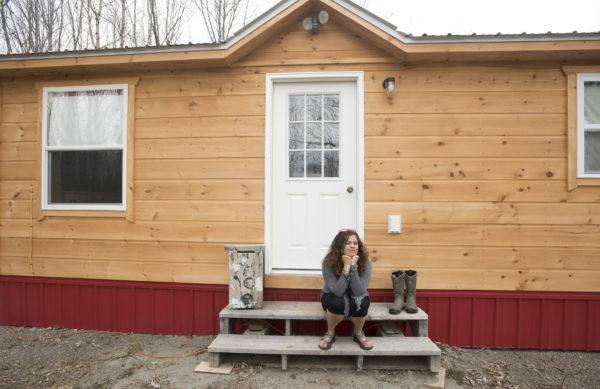 Mary Leaming sits in the front of her tiny home that is nearly complete. Leaming said she had relatively difficult time to secure a small loan to pay for a parcel of land in Unity and an Amish-built tiny house. She finally was able to get financing through a credit union and now her new home is nearly complete. Mary Leaming in her tiny home that is nearly complete. Leaming said she had relatively difficult time to secure a small loan to pay for a parcel of land in Unity and an Amish-built tiny house. She finally was able to get financing through a credit union and now her new home is nearly complete. 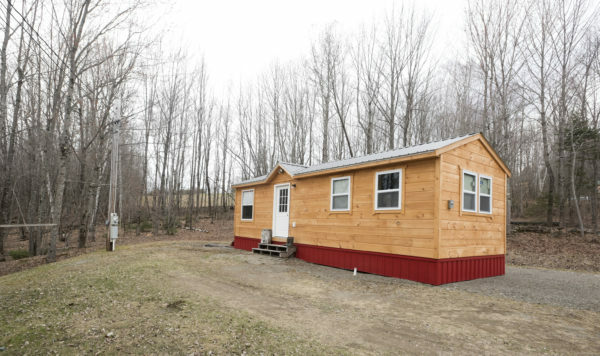 Mary Leaming said she had relatively difficult time to secure a small loan to pay for a parcel of land in Unity and an Amish-built tiny house. She finally was able to get financing through a credit union and now her new home is nearly complete. Unconventional houses are having something of a moment in the United States. Tiny houses have become trendy and solar- and wind-powered off-grid homes have become objects of desire to those who want to become more self-sufficient or simply unplug from fossil fuels altogether. Even unusual building materials such as straw bales and cob — earth and straw mixed together — have become more mainstream. The country’s love of unconventional houses, however, is not always shared by its bankers, who have a well-earned reputation for having a deep preference for financing conventional homes. But that may be starting to change in Maine, which long has had an abundance of houses that can’t easily be categorized. Ashley Messner, a Belfast-based Realtor with the Masiello Group, said that in her professional experience, she is finding that mortgage lenders are slowly beginning to catch up with the market. Recently, she helped shepherd the sale of an off-grid, 325-square-foot tiny house on Pitcher Pond in Lincolnville. The buyers qualified for the loan they needed to buy the house, and then everyone “held their breath,” Messner said, while waiting to hear what the appraiser said. It’s hard to find comparable real estate to an off-grid tiny house, but in the end it worked out. 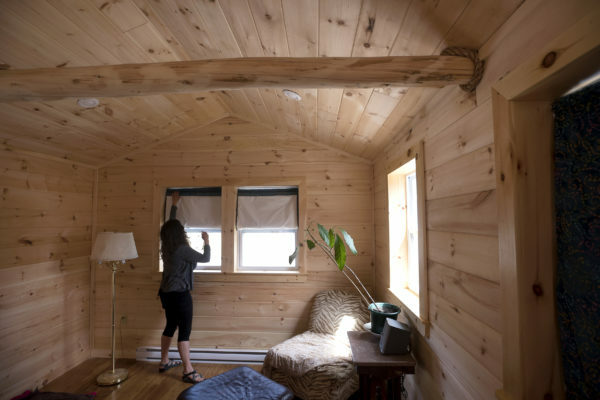 One tangible example of what can happen when you get creative is found on a small parcel of land in Unity, where Mary Leaming, 31, is happily settling into her new 384-square foot, Amish-built home that is financed through Kennebec Federal Savings in Waterville. Nothing about her circumstance is conventional, and it wasn’t easy to convince any bank to take a chance on her. But Leaming was determined. She was eager to make it happen. Last summer, Leaming, the programs director at the Unity Barn Raisers, found herself at something of a crossroads. She needed to move out of her rental, and she was looking forward to living on her own and not with roommates. She has a steady job, good credit and money saved up toward the goal of homeownership but just wasn’t interested in buying the conventional homes she saw listed for sale. Those “normal,” conventional homes were too expensive and too big for just one person, she thought, and she feared a house like that would add complications to her life she didn’t want. Still, she had to live somewhere. And when word got out that she was looking, she learned of a developed lot that was available for sale at a price she could afford: $25,000. She struck a deal with the landowners while sitting at their kitchen table. “It had a well, septic system, driveway, peach tree — what more could you want?” Leaming asked. Well, maybe one thing: a house. So she went to check out Backyard Buildings in Unity, an Amish-owned company that manufactures a wide range of portable structures such as storage sheds, animal shelters and small cabins. She asked if they could build her a tiny home, and they said yes. For $21,000, they would build her a 12-by-32-foot, fully insulated house built with a metal roof, pine walls and bamboo floors delivered to the site, and for a few thousand dollars more, her house would be connected to the septic and electrical systems. Altogether, the house and land would cost $50,000, and although Leaming had been saving assiduously, she hadn’t socked away so much she could pay for it outright. Enter the lender, which eventually offered her a 15-year building construction loan with a fixed interest rate of 3.4 percent. There were hoops to jump through. Leaming had to have a defined bedroom, defined bathroom, a heat source that wasn’t a woodstove and a general contractor to oversee the entire project. The bank’s requirements meant she had to be a little bit flexible in her plans, but that was OK with her. A generous friend acted as her general contractor, so her building costs weren’t raised too much. And in the end, she decided she was very happy to install electric baseboard heat and skip the woodstove. She thinks they definitely succeeded. 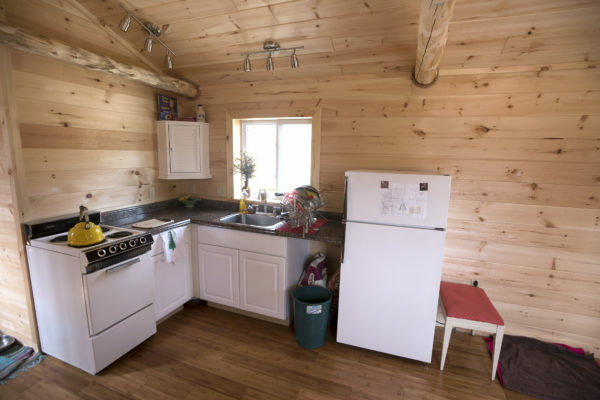 Leaming’s house is small and not quite finished, but as soon as you walk up the makeshift front steps and open the door, you enter a surprisingly spacious room that is completely paneled in warm pine boards. There’s a small, charming kitchen tucked into one corner and a bathroom roomy enough to fit a full-size tub. In her bedroom, built-in cubbies provide storage space and a big window looks out onto the trees and the rolling farmland just beyond. For all of this, Leaming will pay just $275 per month for the next 15 years. That’s a deal, she said, in a market where rents are at least twice that, even if you live with a roommate. Samantha Page, the assistant vice president and mortgage supervisor at Damariscotta Bank & Trust, said her bank tries to work with people who want to finance unconventional homes. Her bank does not resell mortgages on the secondary market, which makes for a little more flexibility than other banks might have. Her bank does require houses to have a well, septic system, power and some sort of heating system. They also need to be “fixed to the ground,” which means that tiny houses on trailers are nonstarters. “If somebody rolls their house away, the bank just lost their collateral,” Page said. And although financing off-the-grid properties is a very challenging process, because there are few comparable properties, the bank is willing to take a look at such homes. Messner said she hopes more banks will follow suit. Unconventional homes are not going away anytime soon, she said, and people want to buy and sell these properties just like they would a standard house. In fact, her agency tends to get more calls about unconventional properties they are listing.